I just finished weaving in all of the ends of my first pin loom woven shawl. This was actually a pretty fast project, and would have been finished ages ago if I couldn’t make up my mind on how I wanted to do it. I used Caron Cakes yarn (Boston Cream) and cut up the colors separately and wound into balls. I then wove up all of the squares. I did not get the same number of squares for each color, which is why the shawl isn’t perfectly symmetrical, but that is fine. I then decided I wanted to make it triangular after all and added the grey squares to the bottom. For stitching up, I first had the squares line up so that the teeth all matched each other. This gave it an eyelet/lacy look. After doing each row, I then stitched them up so that the teeth interlocked, like a zipper. I think next time I’ll line them up for more eyelets, but I am still happy with how this turned out. Next one I’ll also be trying an edging with it. I finished this just in time to bring with me to Rhinebeck (NY Sheep and Wool) tomorrow. It is going to be 70* but in the 30*s in the am, so I’ll be happy to have it. 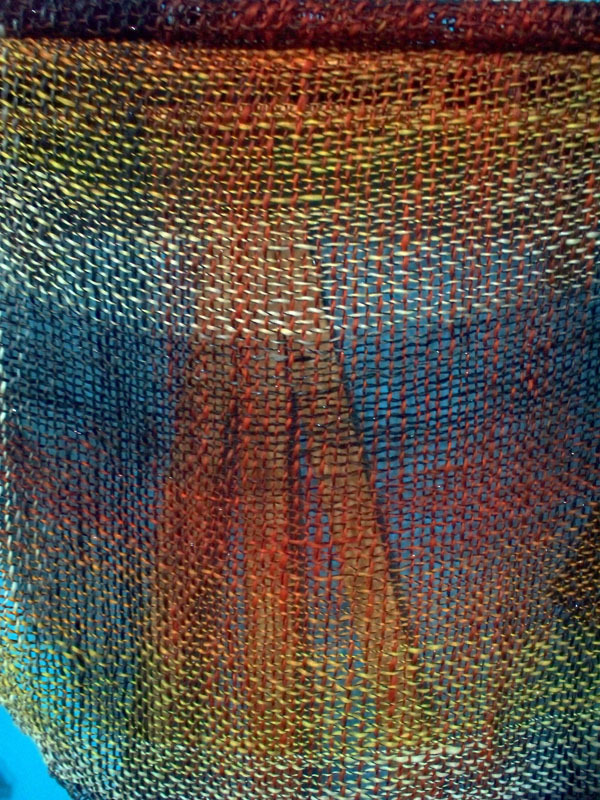 Today I tried out some loops, did some more plain weave, then started trying out more rounded shapes. Just one so far but I’ll be doing more. Slowly working up to doing a full circle. I finally had to advance the warp! Yay progress! This one is smaller than the one I previously posted. More like a shawlette; just enough to keep your neck warm. 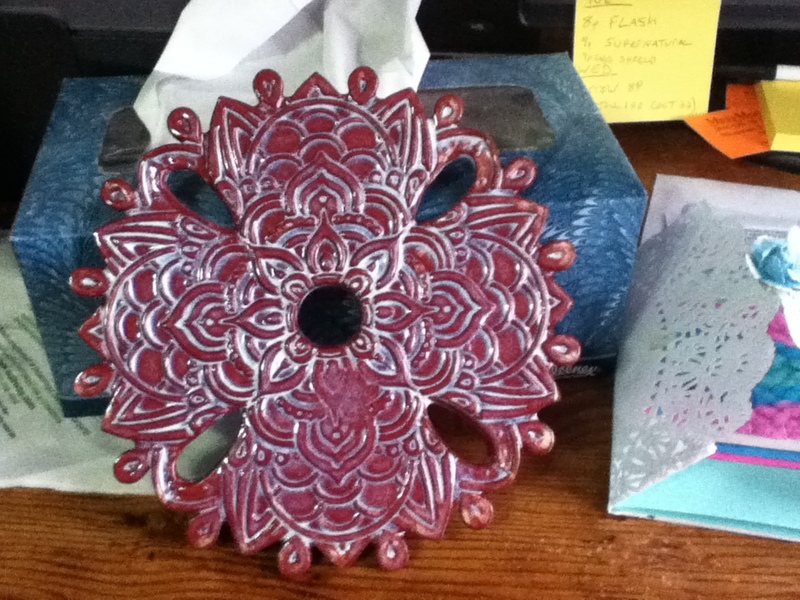 This one is going to my mother since her favorite color is purple. Again, made with handspun yarn by me. 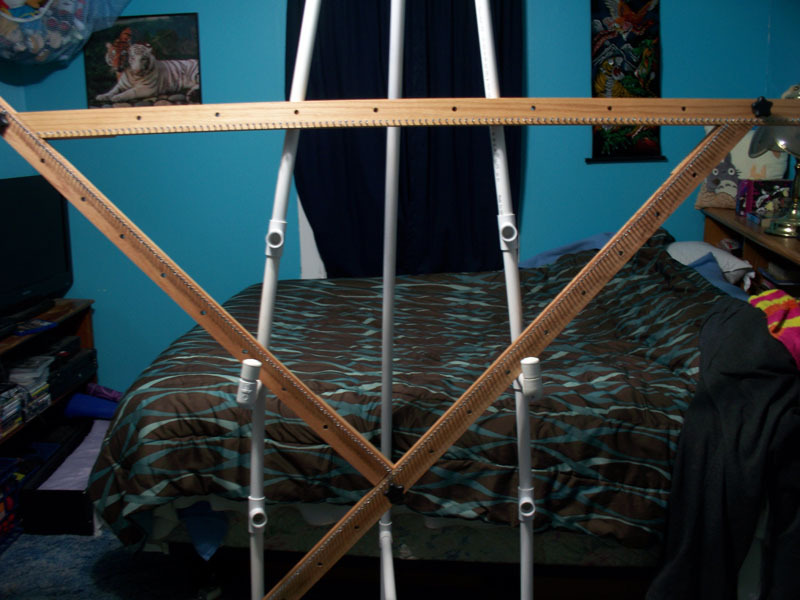 This time I took a picture of my loom. This is a few sizes down from the biggest. Time to do another one! This time I’ll be using brighter colors. I’m so sick of all this snow we’ve been getting. I need more colors around here! Back on Christmas I ordered myself a seven foot adjustable triloom. It finally came in the mail on Friday and I put it together first thing Saturday morning. I then picked out which of my handspun yarns I wanted to use, and the set to work weaving. 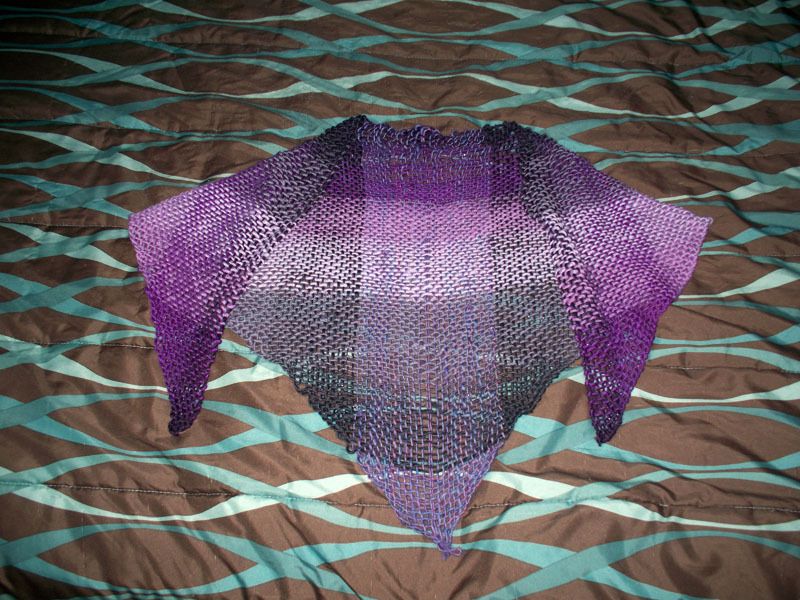 The yarn I used was about sport weight so it made a very light and open shawl. 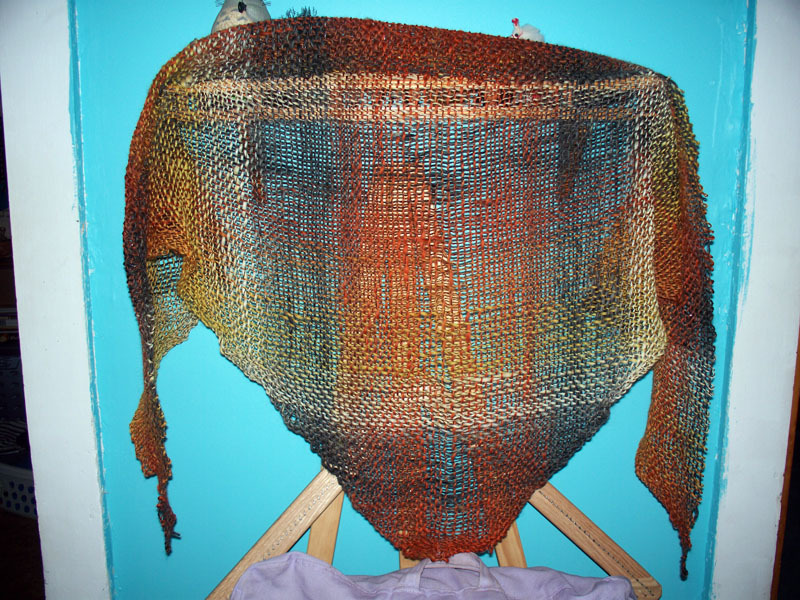 This shawl was done on the next pegs down from the full size, so it’s not the biggest it can be. No photos of it being worn yet as I just finished it at 11:30pm last night. Here are a couple pictures; the first showing full view and the other a close up. So I got this beautiful loom from Quirky Bits-n-Pieces and have been playing with it a bit. I decided to experiment right away instead of doing a solid circle. It came out okay but it needs a bit of tweaking. 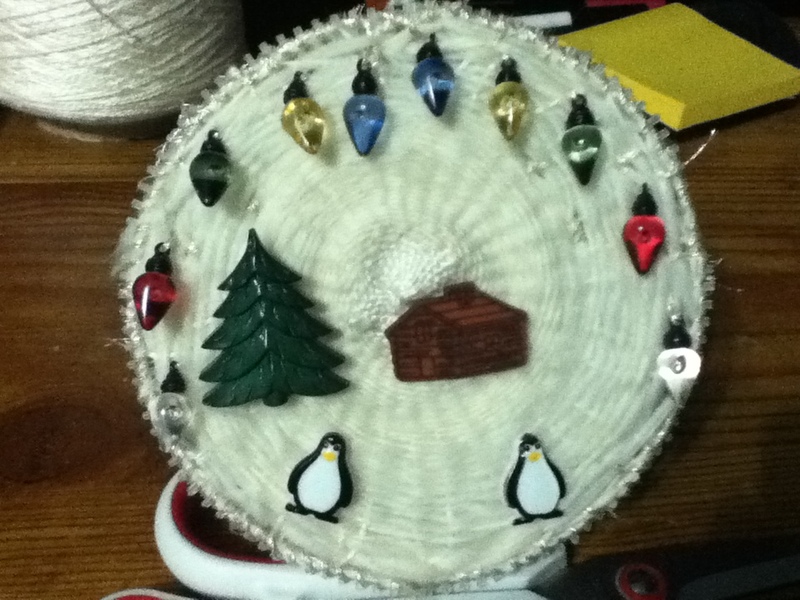 This is made with embroidery thread so it took awhile just to do the center circle. 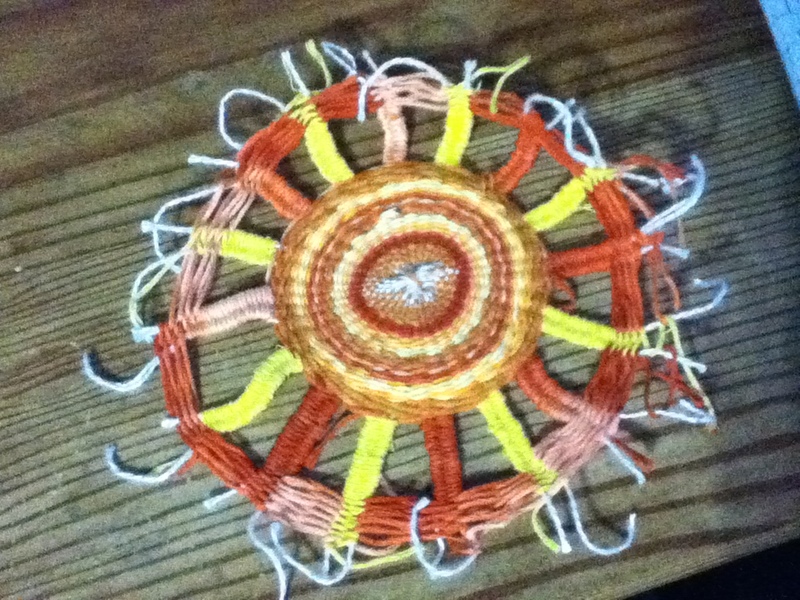 I then started another one this past weekend and am trying to win one of the Majacraft circle looms with it. The theme was winter. How do you think I did? There are metallic stars in there but they don’t show up too well in the pic. Either way, I had fun making it. I used some of my handspun yarn for this one. I still need to work out keeping the weaving a bit loose so it doesn’t curl. I’m already planning out my next one!